*Simple Syrup: In a saucepan, over medium heat, dissolve equal parts sugar and water (1 cup of water and 1 cup of sugar, or 2 cups of water and 2 cups of sugar, etc.). Wash and puree 2 pints of blackberries (I use an immersion blender). 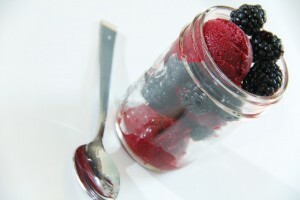 Strain the blackberry puree through a fine mesh sieve (blackberries are very seedy!). Add the zest and juice of one lime and one cup of cooled simple syrup to the pureed blackberries. Pour the mixture into an ice cream freezer and freeze according to the manufacturer’s directions. Serve immediately or freeze or later! If you freeze the sorbet for later, let it rest for 15 minutes at room temperature before serving. This was fabulous:-) A great late-night treat while crafting. When are you bringing me some??? Come over!! But you better hurry, I’m not sure how long it will last :) I was also thinking we may want to try it with a splash of white wine!